Thursday's child was either well loved, mistreated, or made from inferior materials. Regardless, I marvel at the fact that this and many others have escaped the garbage can when they have clearly seen better days. Over recent years, I have developed a curious fascination with vintage and pre-loved dolls. I especially like the primitive ones who've lost limbs but still show up to be admired. I even feel a connection to those scary ones whose one eye is winking at you, and they look like a prop in a scary movie. I probably shouldn't admit to that but they seem to have these fragile yet innocent souls.... the mind boggles. I didn't buy any dolls at Brimfield, but I do have a wee collection of babies and cupie dolls.... the ones who never have any clothes on. O K then. I thank you for dropping in to witness my most random post ever, and wish you a wonderful weekend filled with good weather.... ha! I love her. At least you have a photo of her, even if she didn't come home with you. Oh I love this dolly. 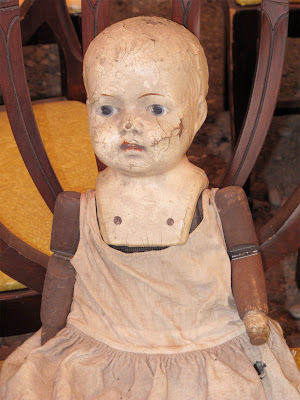 I,too, share your fascination with vintage dolls especially the ones that have been heavily used. It means they have a history ...they're not just stuck on a shelf admired but untouched.